The Horrible Hermit of Hidden Mesa! 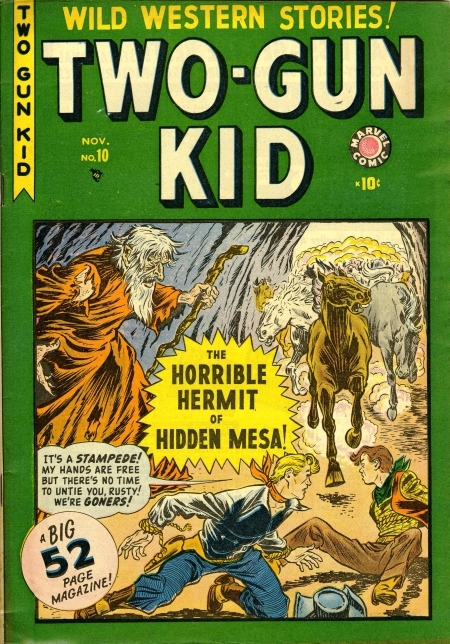 6078 The Horrible Hermit of Hidden Mesa! Notes: Being heavily inked by the Timely Bullpen, primarily Chu Hing on most pages. 5500 The Hunter and the Hunted! Notes: Reprinted (perhaps inadvertently) in The Gunhawk 15 (Jun 1951). Notes: Biography of American frontiersman James Butler "Wild Bill" Hickok (1837-1876); reprinted (perhaps inadvertently) in The Gunhawk 16 (Aug 1951). - Watch for the New Adventures of Your Famous Western Star! 5793 Trapped Between Two Fires!